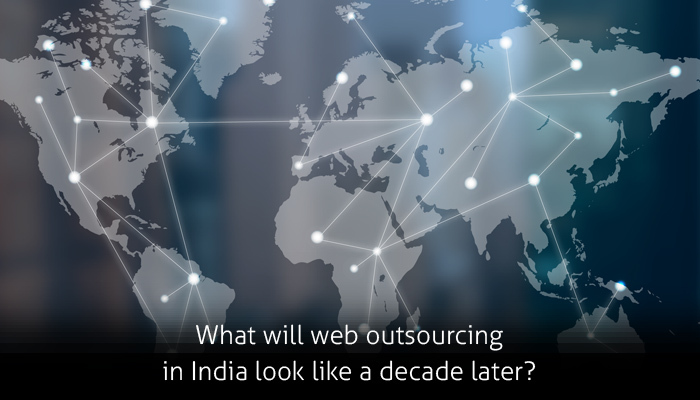 What Will Web Outsourcing in India Look Like a Decade Later? A web outsourcing company in India has all the right reasons for being acknowledged as the most preferred service provider. The prominence of outsourcing IT services in the Indian market has accelerated since its inception. Before we move ahead to explore the prominence of this service in India, first let me define the term web outsourcing. To be precise, web outsourcing could be defined as the process of appointing a third party, which could either be a company or an individual to avail their web services. Cost effective, expert services and quality results are the three main reasons that have fueled the growth of outsourcing IT services. The early 1980's witnessed a prominence of the IT sector in the Indian economy. Having said this, outsourcing IT services by the Indian markets made its way in the early 1990's. With globalization put into effect, the market for outsourcing slowly and steadily opened up to many clients across the globe. In addition to this, the Indian government started to relax the stringent rules and regulations to liberal policies. This played an important role in giving a push to the economy where outsourcing IT services too started flourishing over time. In addition to this, the development of telephony, fiber optics and satellite communications made internet-based communication and transfer of data possible, paving the path for the outsourcing services. This industry, during its infancy, was quite agile grabbing each and every opportunity, to expand its horizons. One of the biggest reasons that have contributed to the progress of web outsourcing in India is the large number of skilled employees in the country. There are approximately 1.2 million engineers being graduated every year. The growing number of exceptional talent and cost-effective services have been some of the important parameters that pushed the IT outsourcing companies in India. Let me take you through various other reasons that justify why India is gaining popularity when it comes to outsourcing web services. Read on to find out about them. A recent report suggests that India holds for about 67% of the global outsourcing share. A really whopping amount of share in terms of contribution. NASSCOM – National Association of Software and Services Companies, believes that the demand for Indian IT outsourcing services will exceed approximately $330 billion by the year 2019-2020. There is yet another statistic that shows more than half of the firms in the USA and Europe has triumphantly ranked India as their most preferred outsourcing destination. All these facts and figures point out a convincing future for a web outsourcing company in India. Also, the government has put up plans to expand the IT sector in many lower-tier cities, expanding the opportunity. The lower labor cost is yet another motivating factor that has set the pace for outsourcing IT services in the Indian economy. In addition to this, India is one of the largest producers of engineers in the world. Moreover, with millions of engineering graduates being added to the Indian economy every year, the IT outsourcing market in India surely has a promising future.